The City of London Cemetery screen before the project: the use of impermeable cement repairs had increased the rate of decay to the point that the stonework had become unsafe. The central shield in particular was perilously close to becoming detached. One of the core principles of conservation is to save and repair as much surviving material as possible. However, repairs often effect a degree of change, posing ethical issues as well as technical challenges for the conservator, and few aspects of conservation are quite as challenging as consolidation. For example, where a fine medieval timber boss has largely been destroyed by woodworm, consolidating its remains in resin raises questions about originality and significance in much the same way that its replacement with a new timber carving would. From a technical perspective, the aim is to find a consolidant which binds the original material together effectively, but without harming it or the rest of the structure. Where the fabric to be consolidated is on the exterior of a building, this can be particularly challenging, and there is much ongoing research into the ability of a new lime-based material, nanolime, to consolidate decayed limestone and plaster. In particular, the EC-funded Stonecore project carried out extensive research into the use of the material from 2008-11 and its findings were disseminated across Europe through a series of public meetings. 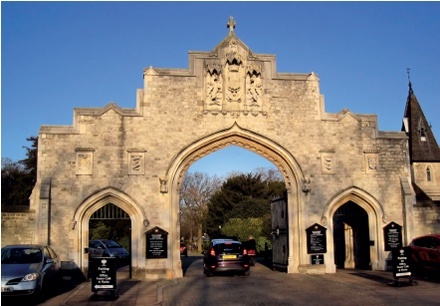 More recently, research carried out at the University of Bath for Historic England has led to the publication of guidance by Historic England (see Further Information). This article will explore nanolime’s benefits and limitations through a case study of the work that London Stone Conservation undertook on the entrance screen to The City of London Cemetery in spring 2016. Nanolime consists of artificially made, nano-sized particles of calcium hydroxide suspended in alcohol. There are two commercially available brands: Calosil was introduced to the market in 2006 followed by Nanorestore in 2008. The alcohol can be ethanol, isopropanol or n-propanol. A nanometre (nm) is a unit of measure equivalent to one millionth of a millimetre and visible only under the most powerful microscopes. Nanolime particles are typically 150nm and since the average size of stone pore structure is around 1,000nm there is a very good potential to fill some of this space, thereby consolidating decayed stone and reducing further loss. Above left: The bottom of the crest before work: note the cementitious repair (left) and adjacent erosion. 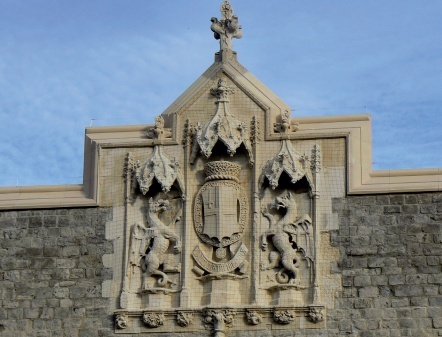 Above right: The bottom of the crest completed: note the retained original fine carved medallion and the new shield above it. The friable areas of stone were first consolidated with nanolime, then mortar repaired and limewashed. For the conservation of limestones and other lime-based materials, nanolime seems particularly appropriate because it is based on a well-established traditional material, lime, as opposed to the organic consolidants widely used in the last century, such as alkoxysilanes. These organic consolidants have been controversial because they change the stone, both chemically and visually (see Further Information, Hull). Using lime is preferable because after carbonation the calcium hydroxide is converted into calcium carbonate which is the main constituent of limestone – in essence a ‘like-for-like’ replacement. One downside is the inconsistency in depth of penetration, which is dependent on varying environmental and stone characteristics. The consolidation of stone with nanolime follows the same principles as ‘lime watering’, which is part of the ‘lime technique’ pioneered by Professor Baker on Wells Cathedral in the 1970s, but has the advantage that the lime is carried by the fluid in a suspension, rather than in a solution like lime water. Consequently, a significantly larger amount of lime can be introduced into the stone with each application; lime water typically contains 1.7g of lime per litre compared to 50g/l available in nanolime. The alcohol of the nanolime will evaporate leaving behind the lime to carbonate and bond with the stone, whereas lime water requires more than 40 applications to be effective. The large amount of water that is absorbed by the stone may mobilise salts in the masonry, accelerating the decay process which the treatment is attempting to slow down. This is a particular problem where salt crystallisation is already contributing to the decay, as is often the case. The main entrance screen of The City of London Cemetery was designed by William Haywood (1821-94), architect and chief engineer to the City Commissioners of Sewers and best remembered for his work on the Holborn Viaduct (1863). The cemetery was built in 1853 at a time when London’s churchyards were in crisis due to a population explosion coupled with an increase in cholera-related deaths. The City of London Corporation moved to build a new ‘super-cemetery’ that would fulfil the needs of all the City churchyards and it was Haywood’s job to instigate this. The cemetery remains the largest municipal facility of its type in the UK. The screen is a traditional construction of Kentish Ragstone walling with Caen stone quoins, copings and decorative carved elements. Caen stone is a soft French limestone which was ideally suited for fine carving and it was widely imported by the Victorians: the down side is that it performs poorly in a polluted environment. 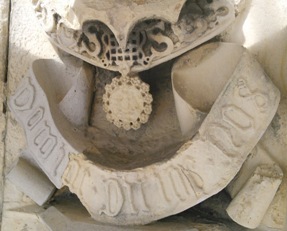 The central crest after consolidation and repair: note the new stone shield, Muscovy hat, copings and foliate corbels with nanolime consolidation and limewash. The rain during the 19th century and up to The Clean Air Act of 1956 was much more acidic than it is today, accelerating the decay of limestones. Carbonates in the stone are turned into sulphates which are more soluble, allowing acid rain to penetrate further into the stone. Sulphate-crystallisation occurs in the drying cycles, and as these crystals grow they expand within the pore structure, causing the stone’s structure to break down, forming voids. Because the entrance screen faces south west it is subject to frequent rain and direct sun. This results in the stonework receiving extremes of weather, including freeze-thaw and wet-dry cycles. 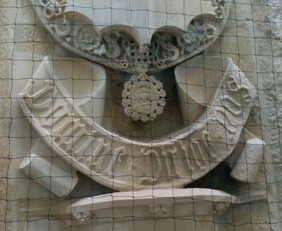 At the start of the conservation and repair programme, the conservators (London Stone Conservation) were faced with the damage caused to the structure by numerous interventions. Premature decay of the stone elements just 43 years after building completion was evident in the many Victorian cementitious mortar repairs, including those to a pair of decorative panels inscribed ‘Erected 1855’ and ‘Restored 1898’. These repairs present a major threat to the future of the screen. Portland cement is both hard and impervious, so it does not allow the stone to breathe. Moisture trapped by the cement is forced to evaporate from the softer more porous stone around the edges of the repairs. Here, the same natural decay mechanisms described above are accelerated due to the greater accumulation of soluble salts. Eventually the cement repair de-bonds from the surrounding stone. The resulting friable surfaces are most prominent in the ornate central panel due to the number of cement repairs, and because the increased surface area of all the sculptural carving amplifies their wetting and drying cycles. Repairing the screen posed a number of challenges. A mix of stone replacement and lime mortar repair was proposed, lime mortar being much softer and far more permeable than Portland cement. As the stone copings had been entirely encased in cement, they all had to be replaced with new stone. Instead of the original Caen of Normandy a similarly fine-grained limestone was specified from Lavoux near Poitier. This is the stone currently used as a Caen replacement at Canterbury Cathedral due to its superior weathering characteristics and frost resistance. On dismantling, the structure was found to be saturated in areas below the cement copings, especially under the canopies of the central panel. The new stone replacement copings would allow the structure to dry out and slow the decay process because, unlike the cement, the stone will allow moisture to evaporate. After close examination of the central panel it was realised that the condition was far worse than originally thought and it was necessary to carry out extra work to improve the structural stability and integrity of the stone elements. It was decided to treat the whole central panel with nanolime to improve the friable surfaces of the stone. A series of nanolime trials was undertaken to ascertain the best type of Calosil to use. The main aim was to ensure maximum penetration so the consolidating effect of the lime will have an effect through the body of the stone instead of just at the surface. The depth of penetration of the nanolime was gauged with the use of phenolphthalein, which turns pink in the presence of un-carbonated lime. 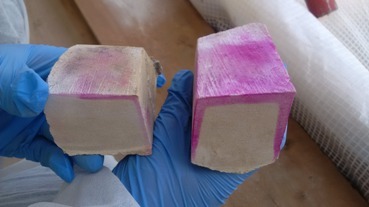 The sample of stone treated with the nanolime was cut in half and sprayed with the indicator: the depth of penetration is clearly seen. Nanolime was applied with a pressurised garden spray and the area was covered in cling-film between applications to delay evaporation of the ethanol and promote maximum penetration. 1 Cement repairs were selectively removed to slow down decay of the carved stone. 2 The entire surface was treated with a combination of Calosil E5 (which contains 5g nanolime per litre) and E25 (25g per litre), the rationale being that the E5 will give greater penetration to start with, followed by the E25 to deliver maximum amounts of lime to the structure. The Calosil was applied with a pressurised garden spray; five applications of E5 followed by three of E25 over a two-day period. The area was covered with cling-film between applications to prevent premature evaporation of the ethanol and so promote maximum penetration. It is important that water is sprayed onto the treated area for a period afterwards because the lime requires both air and water to carbonate. 3 Selected areas of previous mortar repairs were reinstated in a hybrid mortar to slow down further stone decay. This contained lime putty, Prompt natural cement, Westerham sand and Bath stone dust in the proportions 2:1:3:3 (lime: natural cement: sand: stone dust). 4 Stone elements which were at risk of falling because of their overhanging position were replaced like-for-like in Caen stone. Two such stones were the shield bearing the city crest and the Muscovy hat, both of which had multiple fractures and were at considerable risk of detachment. Once the repairs were completed, the whole area was given five coats of specially colour-blended, casein-bound limewash to unite the central panel. This also helped to cover any white bloom from the nanolime and will further protect the fragile nature of the carved work. Remodelling selected areas of cement repairs in lime mortar helped to slow down the decay of the stone and the nanolime definitely improved the many flaky, friable surfaces on the panel, providing a much firmer surface for the application of limewash. Nanolime consolidation seems a viable method for surface protection but for deep penetration it proved difficult to achieve reliably. Tests indicated that the best penetration achieved was 7mm using Calosil E5 (right), which was generally considered sufficient to bind the friable surfaces to sound substrate. Better results have been obtained in laboratory conditions. The environmental factors of temperature and particularly relative humidity (RH) have a major effect on the time required for evaporation of the ethanol and consequent depth that nanolime is carried into the stone. Colder, overcast days with high RH offer the best conditions for obtaining good penetration results on site. Used in conjunction with mortar repairs and limewashing, the consolidating effect to the surface provided an excellent ground to receive further treatments of lime protection, given that the friable stone surfaces are not sound enough to bond properly with mortar and limewash. It is tempting to view nanolime as a new wonder treatment. In practice, however, its success depends on many variables, including the pore structure of the stone and the type of damage that has occurred, as outlined in Historic England’s new research publication. In some stones, for example, the pore structure may have limited continuity, reducing the depth of penetration, and larger gaps and fissures cannot be bridged by nanolime alone, such as where delamination has occurred. The research also highlights problems where limestones are covered by a gypsum crust, as this layer can be almost completely impermeable, and any consolidation may actually be counterproductive. Nevertheless, what nanolime does offer is another weapon in an arsenal of conservation materials, and in many situations it can be used very effectively in combination with other lime products. In this case, the entrance screen certainly benefitted from this new material in slowing down the complex combination of decay mechanisms which were eroding the central panel. Nanolime is not suited to every situation but it does offer an option to stave off the need to replace original fabric and extend the life of our historic structures without always having to resort to stone replacement or less sympathetic consolidants. BEN NEWMAN is a stonemason and project manager for London Stone Conservation, a member of the SPAB’s Education and Training Committee and a William Morris Craft Fellow. He is also a Freeman of The Worshipful Company of Masons and a member of its Craft Training Committee.